Welcome to Faded Rose Factory™, find here hand crafted works of art designed after Boudoir dolls, Pillow dolls, Bed dolls from the 1920's. Look at our Past dolls to see the selection of Faded Rose creations. In the years prior to the Great Depression a beautiful, yet almost forgotten doll made her appearance she went by many names Boudoir doll, Pillow doll, Bed doll, Flapper doll.......we call our Version Faded Rose. 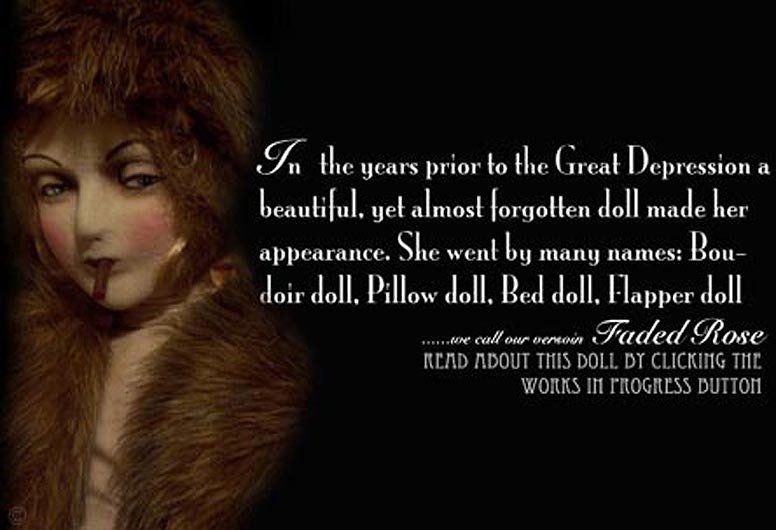 Read the history behind the Boudoir doll, and the history behind Faded Rose. Browse our selection of dolls available. Artist doll, For sale. Here find the history of the boudoir doll, view pictures of our collection of real boudoir dolls from the 1920's through to the 1940's. Read about my company and the magical creations that are for sale. They range in size from 27" - 36" inchs .Each Faded Rose is a hand sculpted work of art there may be small imperfections that will only add to the uniqueness of each handmade creation. While we’ve tried to incorporate vintage fabrics materials and accessories into the dress designs to give the Roses a genuine touch of their times, this is not always possible. But, we have used colors and fabrics appropriate to the Art Nouveau and Art Deco period. Thank you to The House of Lebarre for making such wonderful clothing that reflects the era of the boudoir doll. Also find work from the House of LeBarre. Her work with fabric sculptue. soft sculpture, and beautiful Jewerly. Her work includes Fairies, Witches, Frogs, cats, and other Fairy Tale creations.They are embellished with glass, crystal beads and fine stones, clothed in only the finest locally available velours and iridescent materials. The pieces are accented with a variety of lace, netting, ribbons and cords. Visit the House of LeBarre Link. All Works of art, dolls located at this website are one of a kind ooak.